With the aim of reducing forage costs across his 140-cow herd, dairy farmer Angus Wiggins has switched to a Future Grass Technology zero grazer on his Devon farm. Geoff Ashcroft reports. 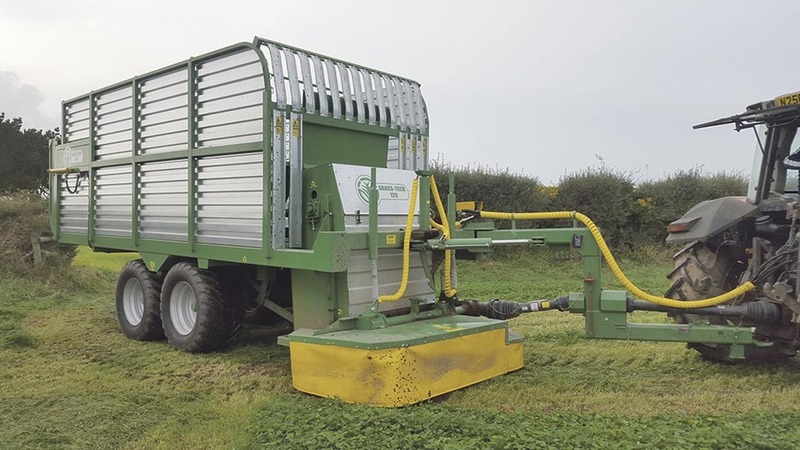 The Grass Tech GT120 uses a 2.1m Galfrey twin drum mower followed by an elevator to transport grass into the trailer body. As falling milk prices dominate the dairy industry, producers continue to look for ways to trim costs. 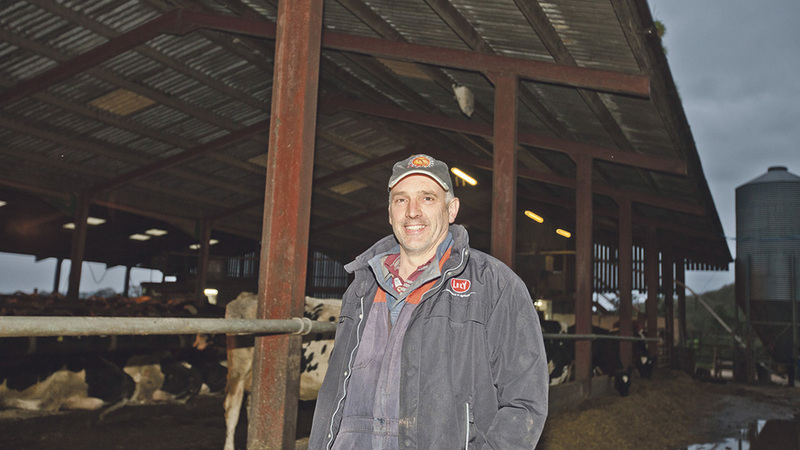 For Devon dairy farmer Angus Wiggins, the switch to a zero grazing system is one that has moved his business in the right direction, after yielding a reduction in clamp silage costs along with a significant saving on concentrates. From the 120ha (300 acre) Twin Oaks Farm near Bickleigh, Devon, the Wiggins family has been feeding its cows using TMR on a year-round basis. While the mix comprises grass and maize silage, topped up with concentrates, cows are given extra cake when entering the farm’s two Lely milking robots. Angus Wiggins is pleased with the cost savings achieved from zero grazing. 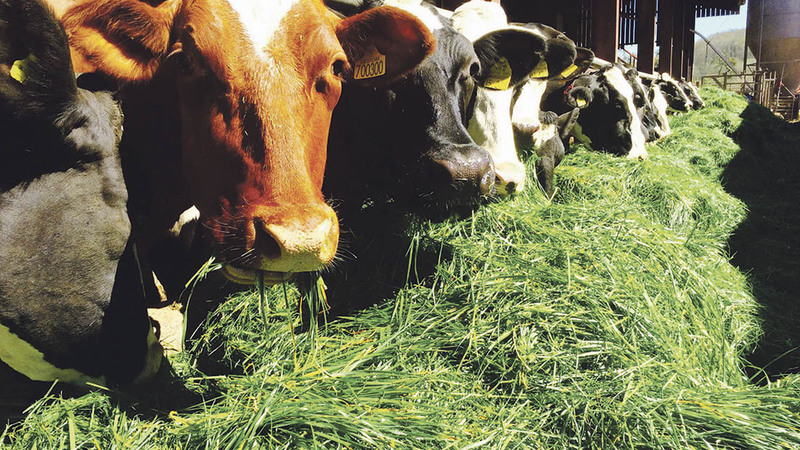 The shift to zero grazing has enabled fresh grass to be brought in to the herd every day through the spring and summer months, replacing the reliance on TMR and concentrates for about six months of the year. The answer he sought came from Irish manufacturer Future Grass Technology, with its GT120 model. 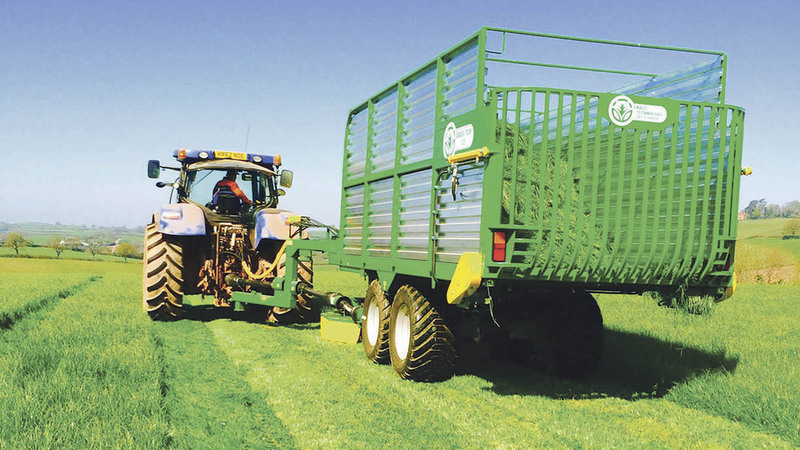 All Future Grass Technology’s models work on the same principle - the only difference is the size of trailer body in use. A 2.1m Galfrey twin drum mower sits below the drawbar to cut grass and feed it into a transport elevator. Unlike forage wagons, this is a non-chopping unit, which simply pushes crop upwards into the trailer body. A moving floor conveyor is used to move grass towards the rear of the trailer during filling. And the same mechanism is used to eject the load, once the rear door has been opened and raised. A pto drive supplies power for the drum mower, with the tractor’s hydraulics controlling the rest of the machine, including mower bed raise/lower, drawbar offset and tailgate. Long term, Mr Wiggins is looking to zero graze for at least six months of the year. Mr Wiggins brings in two loads a day – typically, cutting about one hectare to source 12 tonnes of fresh grass. Power comes from the farm’s T7.185 and is more than ample for the task, says Mr Wiggins, though having a bit in reserve is useful on some of the steeper slopes around Twin Oaks Farm. A benefit of zero grazing for a herd that is housed on a year-round basis is a reduction in clamp silage requirement. Throughout that time, he reports the herd’s 10,000-litre yield average has been maintained. It takes about 5-10 minutes to fill the trailer, and the machine is small enough and agile enough to manoeuvre around farm buildings, to feed out. But it’s not all win-win. Mr Wiggins says that running a zero grazing regime has shifted his focus of attention onto improving grassland management techniques. “Grass will be cut no later than three-leaf stage, and our intention is to apply the grass wedge principle used for grazing, to our zero grazing regime,” he says. Variety choices with high D values will be under scrutiny, as will field location and topography as grass leys are renewed. He says doing so will enable the farm to make greater use of higher quality grass, enabling better decision making when it comes to choosing which fields to zero graze, and when.